This week, we pay a visit to fragrant, scenic Nal Hutta, adopted home of the Hutts and the starport at Jiguuna. A prominent sign outside the terminal announces arrivals and departures and their current status. 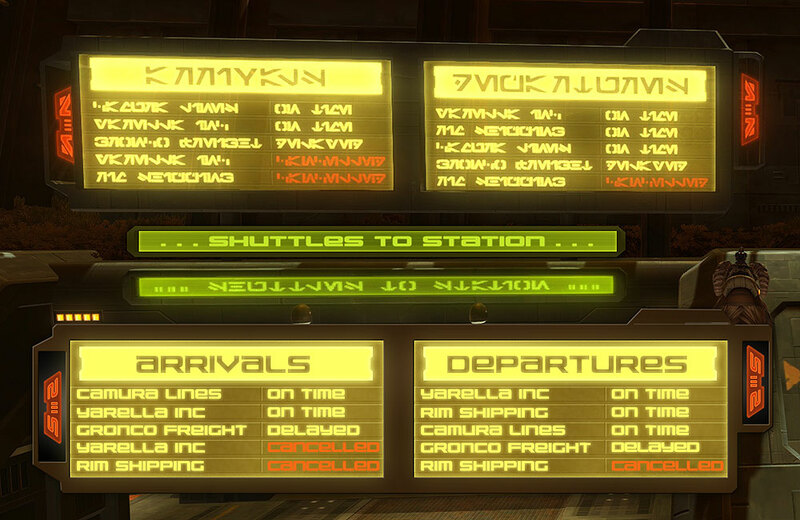 The listings are of transport services, many of which have their origins in Star Wars lore. Camura Lines was first mentioned back in West End Games’ Star Wars The Roleplaying Game. Yarella is a common Hutt name and thus appropriate for the sign’s context. Rim Shipping is generic enough, but could also be a precursor to “Core to Rim Shipping”, which also appeared in WEG’s SWRPG. Finally Gronco seems to be a Star Wars-ification of the word “bronco” or simply just a funny name that could very well apply to many a Hutt, Wookiee, Gamorrean or a hot shot pilot. Only half of the scheduled flights are on time, and nearly a third are cancelled, so getting to and from Hutta is a coin flip at best. And you better hope the Hutt Cartel hasn’t overbooked your flight. Being put into Carbon Freeze and dumped in with the luggage is standard procedure for folks who won’t give up their seats. But at least you get there. Thawing and dealing with the consequences of hibernation sickness, however, are your own responsibilities. 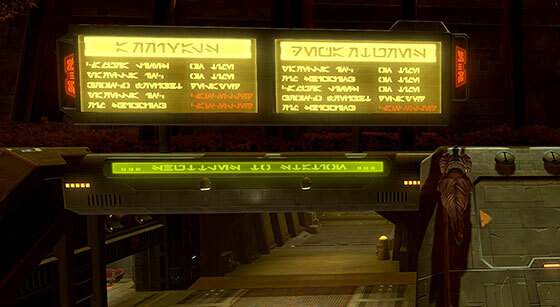 This is one of many signs in SWTOR that uses the non-standard Aurebesh font Galactic Basic. The small, red glyphs that bracket the large sign seem to feature a stylized Senth letter, so I have re-created it as “s” in my version. Given that the sign is for a star or shuttle port, it seems like a safe pick.